Turkey signs an armistice with the Allies, becoming the second of the Central Powers to quit the war, following Bulgaria’s surrender on 29 September. The Armistice of Mudros is signed by the Ottoman Minister of Marine Affairs, Rauf Bey, and the British Admiral Somerset Arthur Gough-Calthorpe, on board HMS Agamemnon in Mudros harbour on the Greek island of Lemnos. The terms of the armistice state that hostilities between the Allies and Turkey are to cease from noon on 31 October 1918. 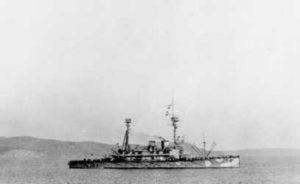 The British warship HMS Agamemnon in Mudros Harbour in 1915. Image courtesy Wikimedia Commons. This entry was posted on October 30th, 2018.